Back in October, 2008, we posed the question on this website: Do Electronic Billboards Belong in a Green City? We cited a Texas study showing that energy used by one full-sized digital billboard was equivalent to that of 13 average homes, and now a much more detailed and comprehensive study of digital billboards and other signage in Philadelphia paints an even more stark picture of those signs as energy hogs whose proliferation around the country is completely at odds with societal goals of conserving energy and reducing dependence upon fossil fuels. And, as a further indictment of these billboards being aggressively pushed by Clear Channel, CBS Outdoor and other major sign companies, a just-released study of air quality in Los Angeles has show that light pollution has a measurable effect in worsening smog. For those interested in the scientific explanation of this effect, see link below for the report. For others, it may suffice to know that the digital billboard rotating ads for movies, TV shows, and fast food is making the air they breathe a little bit dirtier. Of course, digital billboards are only one source of light pollution. 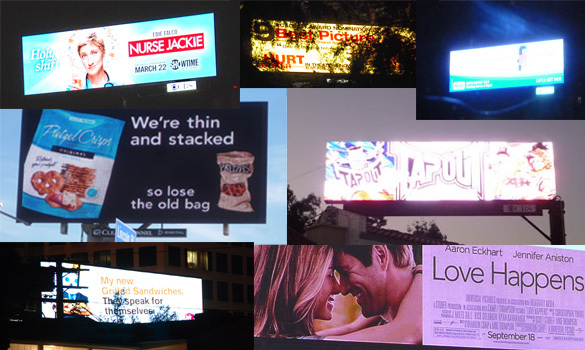 Conventional billboards and other forms of off-site signage are commonly lighted from below so that much of the light escapes into the sky. Extravaganzas of light and advertising, such as can be found at L.A. Live and parts of Hollywood Blvd. also contribute to light pollution, which will only get worse if some projects proposing “architectural lighting” embedded into the skin of high-rise buildings become reality. Some business people, politicians, and others have been arguing recently that more bright, flashy lighting is needed to create excitement and stimulate economic activity in commercial areas. While the truth of this hasn’t been tested in an analytical way, and is most often based on anecdotal evidence, real science tells us that this lighting has a serious cost to both the health of our society and its individual members. – Do Electronic Billboards Belong in a Green City?